On June 25th, Glu Mobile, the mobile gaming developer and publisher behind Deer Hunter Reloaded, released Kim Kardashian: Hollywood to the App Store and Google Play. Glu had expressed optimism over the potential of its remaining 2014 product pipeline its Q1 earnings call on April 30th; despite projecting negative EBITDA in the second quarter, Glu stated that it expected non-GAAP revenue in 2014 of up to $161.5MM, for 42% year-over-year growth. Glu achieved impressive growth in Q4 2013 and Q1 2014, more than doubling non-GAAP revenues and reaching comfortable profitability on an EBITDA basis. The company’s strategy, as it stated in its Q1 earnings call, has been to focus on (among other things) deeper monetization and efficient marketing. It has also moved strategically into franchising and partnerships, creating the official mobile game counterparts for numerous large-budget films (Glu’s Hercules: The Official Game was launched on July 3rd ahead of the late July release of MGM’s Hercules film; Glu has also recently announced similar partnerships for upcoming films in both the James Bond and Terminator franchises). Against the backdrop of Glu’s precipitous rise in fortunes, and included in its projected 42% year-over-year revenue growth for 2014, Glu probably expected at least a moderate level of commercial success from Kim Kardashian: Hollywood. But even the most wild optimism for the game within Glu’s ranks likely fell short of assessing the extent to which it has performed: within days of its release, the game rocketed into the Top 10 grossing chart in the US App Store, and as of this writing, it sits higher on that chart than Supercell’s Hay Day and Boom Beach and King’s Farm Heroes Saga. Of course, a comparison between titles from mobile gaming’s juggernauts and Kim Kardashian: Hollywood on the basis of revenue is inappropriate, since Glu is likely surrendering a hefty percentage of the game’s income for the privilege of using Kim Kardashian’s likeness. But still, the astonishing success of the game was not captured in Glu’s 2014 revenue guidance; Douglas Creutz, an analyst with Cowen & Co. (which has a prophetic track record with Glu), expects that Kim Kardashian: Hollywood may generate annual revenues of $200MM, with much of that being delivered in 2014. Glu’s stock price has benefited from this enthusiasm: shares in the company reached a 52-week high on July 11th, closing at $6 per share. 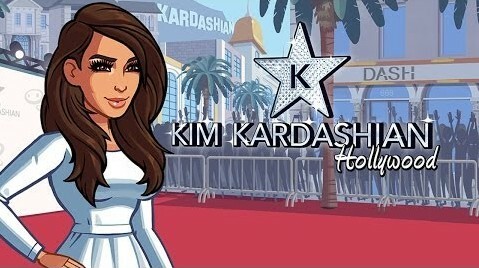 Glu’s stock price is up more than 58% since Kim Kardashian: Hollywood was launched. While having Kim Kardashian’s name attached to the game was almost certainly a factor in its stunning ascent up the App Store’s downloaded chart, the celebrity partnership alone doesn’t adequately explain the game’s commercial success: after all, branded games and games with movie and celebrity tie-ins launch in the App Store frequently and few arrive in the top grossing chart. The commercial performance of Kim Kardashian: Hollywood seems to be driven by three factors: demographic ingenuity, a celebrity with broad and completely impressionable appeal, and consumer fatigue with the mass proliferation of existing gameplay mechanics. Quite possibly the most profound aspect of Kim Kardashian: Hollywood in terms of its marketability is the fact that it is targeted to a demographic that is almost completely ignored by game developers: non-casual women gamers. While it goes without saying that Kim Kardashian: Hollywood does not represent the interests and tastes of all women, it does seem reasonable to assume that the game was designed by Glu to skew more heavily to women than men. This is generally true of casual games, too: more than half of Candy Crush Saga players are female. But Kim Kardashian: Hollywood ostensibly aspires to be deeper than a casual game; Glu’s intentions, in terms of engagement and monetization, seem to have been to create the female analog to Clash of Clans, which skews male by a factor of three-to-one. Whether the word “core” can be applied to Kim Kardashian: Hollywood is debatable. The term “core” with respect to games is somewhat amorphous; this article in Gamasutra does a capable job of defining a spectrum of the “core” descriptor, across which factors like session frequency, willingness to pay, and tolerance for frustration contribute to a player’s personal gaming predilections. No matter Glu’s intentions, Kim Kardashian: Hollywood has very clearly resonated with its player base: as of this writing, the game has a 5-star rating with more than 27,000 reviews in the US App Store. Kim Kardashian is a meta celebrity: someone who is famous by virtue of being famous. While her marriage to rapper Kanye West and the reality show that revolved around her family may have introduced her to the public, she hasn’t established a following of admirers through a specific accomplishment or skill. Because of that, she also hasn’t disqualified herself from receiving public attention on the basis of not wanting to alienate people that aren’t interested in some specific accomplishment or skill. 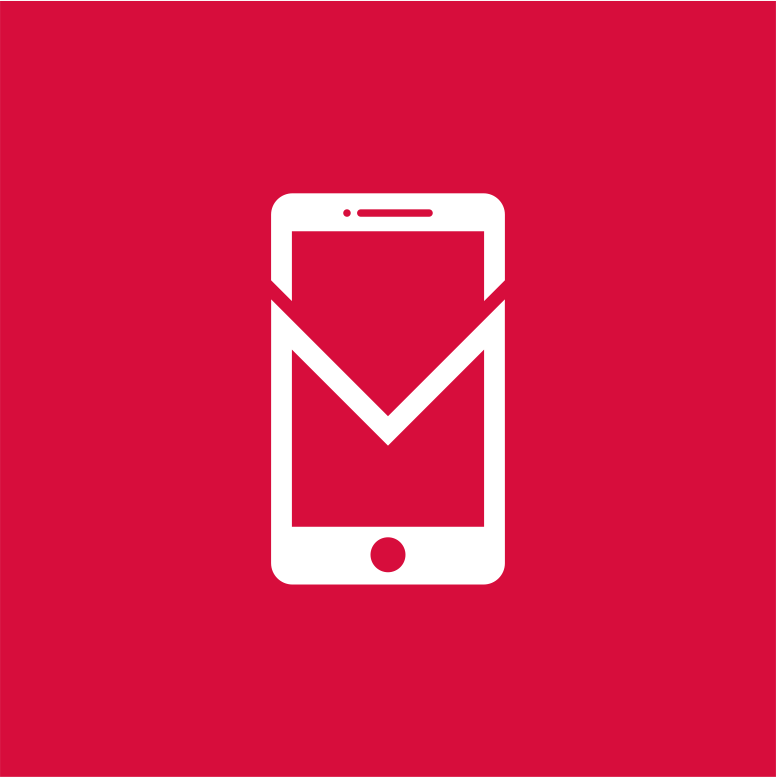 The goal of branded mobile games is to alleviate user acquisition costs by tapping into an established fanbase and generating instant recognition and interest in a title. The brands most closely associated with specific entities – such as sports, or movies, or singers, etc. – can only hope to appeal to enthusiasts for those entities (eg. a branded baseball game is probably only going to achieve interest – and, thus, downloads – from fans of baseball, which may not be numerous enough to significantly impact chart position). Kim Kardashian is not a specific entity because no one knows her as the result of a specific accomplishment or skill; Kim Kardashian is an idea, and as such there is no singular group of people that are exclusively receptive to her brand. A huge percentage of the iPhone-owning population in Western markets knows Kim Kardashian (although many may struggle to understand why), and as such that huge percentage may be influenced by her branded image on a mobile game to an extent that very few other brands could achieve. 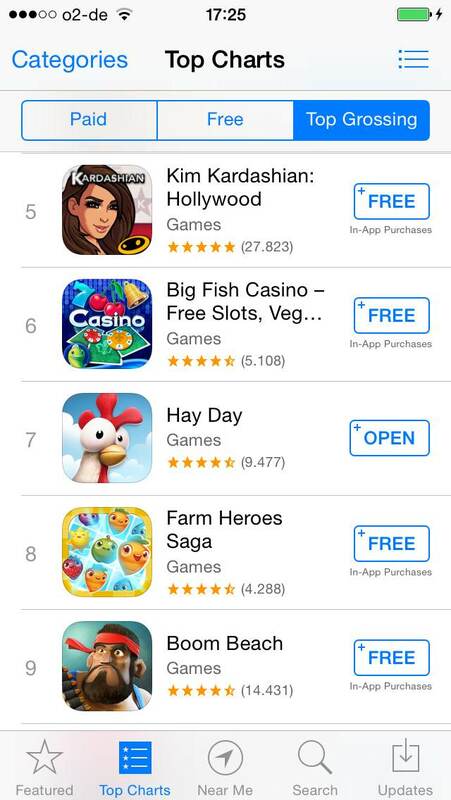 Additionally, because she is not known for any specific reason, many of the installs that led to Kim Kardashian: Hollywood ascending the Top Downloaded chart (and thus garnering a sufficiently large user base to propel the game into a top 10 position on the Top Grossing chart) may have been the result of sheer morbid curiosity — what could a Kim Kardashian game possibly be about? The Top Grossing chart has been dominated by well-worn gaming archetypes for years: perennial top grossing mainstays Clash of Clans and Candy Crush Saga were both released in 2012 and have spawned scads of clones. And the Top Downloaded chart is now at the mercy of the gimmick economy, besieged monthly by clones and clones of clones that summit the chart and then disappear just as quickly. Although Kim Kardashian: Hollywood is not powered by a completely novel game mechanic – it is similar to Pocket Gems’ Campus Life, an isometric side-scrolling simulation game which was released in 2012 – it is unique within the context of Top Downloaded charts, which, from the perspective of most gamers, renders it differentiated and new. The coup de grâce for indies? The longevity of Kim Kardashian: Hollywood’s success will depend on, among other things, Kim Kardashian’s continued public notoriety as well as Glu’s ability to foment some kind of a community around the game (lest it succumb to the fate of countless shock apps that were downloaded by many in at least partially ironic interest). But even if the game doesn’t achieve the heights of analyst optimism, it has accomplished much by elbowing its way into the exclusive Top 10 Grossing club. While some pundits have found aspects of Kim Kardashian: Hollywood’s gameplay troubling, what is perhaps most concerning about the title is that it may create even more distance between indie studios and large, well-financed developers by ushering in a new age of partnership-based user acquisition. Skyrocketing marketing costs have put indie game developers at a disadvantage in achieving product awareness for the past few years, but a number of financing options for small studios have at least made pervasive launch campaigns conceivable. If branded games and celebrity tie-ins set a new standard for mobile game launches, small studios without the business development savvy to reach celebrities and negotiate partnerships with them may face even more agonizing and exclusionary hurdles to acquiring users than mere cost.